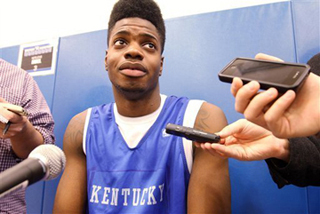 Kentucky freshman forward Nerlens Noel has been cleared by the NCAA to play this season for the Wildcats. NCAA spokesman Cameron Schuh said the 6-foot-10, 228-pound Noel was “cleared to practice and play” following a probe into the funding of unofficial visits to Kentucky. Schuh did not provide any details or findings of the NCAA’s investigation. Before the recent decision, Noel, considered the nation’s top recruit, could only practice after finishing summer classes to meet reclassification requirements. Kentucky spokesman DeWayne Peevy said via text that the school does not confirm eligibility until competition begins. The defending national champion Wildcats open Nov. 9 against Maryland at the Barclays Center Classic in Brooklyn, N.Y.
Kentucky coach John Calipari first revealed Noel’s status during an appearance on ESPN promoting the debut of the network’s all-access program about the Wildcats. Noel is part of Kentucky’s highly touted freshmen class including 7-footer Willie Cauley-Stein, guard Archie Goodwin and forward Alex Poythress. His game has been compared to Anthony Davis, last year’s Final Four most outstanding player after leading the Wildcats to their eighth title. Davis went on to become the NBA’s top overall draft pick and win an Olympic gold medal with Team USA in London this summer. Noel, who talked with Davis after arriving on campus, didn’t seem concerned about his eligibility last week.